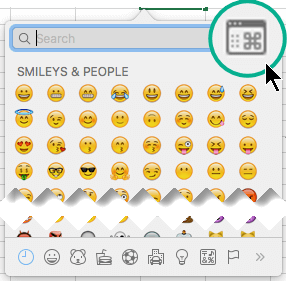 The Symbol dialog box shows emoji by default. The expanded dialog box shows several character sets to choose from. On the Insert menu, click Advanced Symbol, and then click the Symbols tab. Click the symbol that you want. On the Insert menu, click Advanced Symbol, and then click the Special Characters tab. Click the character that you want. On the Edit menu, click Emoji & Symbols. Click where you want to insert a symbol. Click the Symbols tab , and then click the symbol that you want to insert into the document. 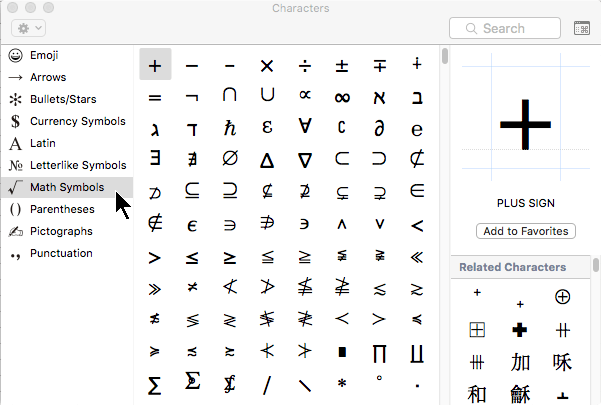 If you do not find the symbol that you are looking for in the Symbol Browser, you can look in the Symbol dialog box. On the Insert menu, point to Symbol, click Advanced Symbol, and then click the Symbols tab. On the Insert menu, point to Symbol, click Advanced Symbol, and then click the Special Characters tab. On the Edit menu, click Special Characters. In the Characters dialog box, on the View pop-up menu, click All Characters. Click the By Category tab, click the arrow next to Symbols, and then click the symbol category that you want. Click the symbol that you want to insert, and then click Insert.